Natural Resources Wales works to establish sources of pollution around Swansea Bay. Some of this work is carried out in partnership with the City and County of Swansea and Dŵr Cymru Welsh Water. Inspections are carried out by Natural Resources Wales in partnership with the local authority and the water company. These are carried out pre-season (before the 15th of May) and mid-season (during the bathing water season). Between 2011 and 2015 Natural Resources Wales, Aberystwyth University and City and County of Swansea worked together on the Smart Coasts project funded by Interreg to the tune of 2 million euros. One of the main aims of the project was to determine the causes of reduced water quality in Swansea Bay. The project included a bacterial source apportionment study into the sources of bacteria in the Swansea Bay area. These results are used to target our pollution prevention investment. Swansea Bay is potentially impacted by numerous storm, emergency and surface water outfalls, both along the foreshore and within the main freshwater streams and watercourses, particularly during heavy rainfall. The storm overflows are there to protect domestic properties in Swansea and Mumbles from being flooded by sewage during periods of heavy rainfall. However, these overflows can result in a deterioration in the quality of the water in the River Tawe and at Swansea Bay bathing waters. In recent years, telemetry equipment has been installed in most of the overflows by the water company. This technology has allowed Dŵr Cymru Welsh Water to respond to warnings of blockages in the sewerage system and has reduced the number of actual and potential overflows. Five Combined Sewer Overflows (CSOs) in the Singleton Park area were improved between the 2013 and 2014 bathing seasons. Three of them have been blocked up and the remaining two have screens on them to stop sewage debris from entering the sea. These improvements have led to a marked reduction in spills into Brynmill Stream and an obvious visual improvement to the stream. A further two CSOs have been removed near to the cricket ground and the remaining one improved to reduce spills. In Mumbles the number of storm spills to the foreshore has been reduced by redesigning and improving the sewerage system and CSOs. Surface water has been removed from the system which should reduce the number of spills from Mumbles Sewage Pumping Station via Knab Rock. Two more ongoing CSO improvement schemes in Blackpill are due to be finished during the 2017 bathing season. One CSO is being revoked at Derwen Fawr. Two other CSOs at Dunns Lane and Sketty Green are being improved and having telemetry added, which means that spill data can now be collected. A project known as Event Duration Monitoring (EDM) is underway to install telemetry on Combined Sewer Overflows (CSOs) within 2km of a bathing water by 2020 so that Dŵr Cymru Welsh Water (DCWW) know when the CSOs are operating and can work to reduce spills. Twenty CSOs near Swansea Bay are included in the project. DCWW are currently developing a solution to decrease the number of spills to the designated bathing water from the sewerage network. Key assets have been identified and the solution is likely to focus on surface water reduction and network alterations. The cost of these solutions is likely to be significant and will be met through the AMP programme. It is hoped that work will be completed by the end of 2016. In 1999, the Swansea sewer system was significantly upgraded and a new wastewater treatment system was installed at Fabian Way. 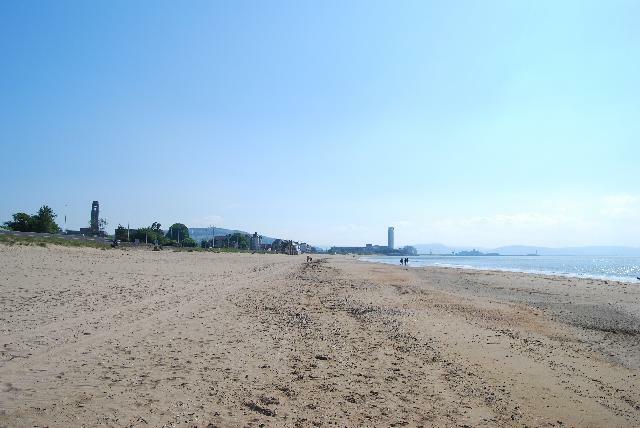 This resulted in a vast improvement to the water quality in Swansea Bay. Since then, Natural Resources Wales has worked with Dŵr Cymru Welsh Water to make further improvements to the sewerage system and Swansea Wastewater Treatment Works. Natural Resources Wales and the City and County of Swansea have been working together to improve the bathing water quality in Swansea Bay for a number of years. In 2010, Natural Resources Wales and the City and County of Swansea entered into a collaborative agreement to progress with this work by carrying out a misconnection survey in the Swansea Bay Area between 2010 and 2013. This work is still underway in a number of catchments draining into Swansea bay, and is now being supported by Dŵr Cymru Welsh Water. Streams are typically affected by sewage and industrial run off from further up the catchment. Swansea Bay is mainly influenced by the Rivers Tawe and Clyne. There are also numerous small streams and over 25 surface water drains which empty into the bay. These can be a source of reduced water quality after periods of heavy rainfall. Swansea Wastewater Treatment Works discharges offshore to the east of Swansea Bay. Disinfection through ultra violet treatment of the effluent protects the quality of the bathing waters. Afan Wastewater Treatment Works also discharges offshore, further east towards Aberafan. Natural Resources Wales samplers make visual observations of the beach at every visit. This includes assessments of sewage debris, animal faeces, litter and oil or tar. At Swansea Bay, data are available for the four year assessment period from 2014-2017. Sewage debris was observed in trace amounts on less than ten per cent of occasions. Trace amounts of animal faeces were noted at the site on a minority of occasions. Trace amounts of litter were observed at the bathing water between twenty per cent and one third of the time. Oil and tarry residues were not noted at this site. Natural Resources Wales is working with a number of private owners regarding potential pollution sources to Swansea Bay. This work involves dye tracing, misconnection surveys and face to face meetings. Poorly maintained private sewage treatment facilities could be a source of pollution, therefore the registration of all qualifying private sewage systems in Wales was required by 30 June 2012. The primary aim of this exercise is to provide increased protection for the environment and sensitive features such as bathing water beaches. Where discharges from properties are identified in the catchment that are not on mains sewerage, Natural Resources Wales will endeavour to ensure registration has been made, unless already a permitted discharge. The natural drainage (hydrological) catchment surrounding the bathing water is highly urbanised, with a busy retail and light industrial sector located along the lower reaches of the River Tawe. The upper reaches of the catchment are predominantly agricultural.